Taittiriya Upanishad Parayanam​ was rendered by 7 Veda Vidwans at Swamimalai Sri Swaminathaswamy Temple on 14-12-2017 on the occasion of Aradhana of HH Jagadguru Pujyashri Chandrasekharendra Saraswathi Mahaswamigal as per benign directions of Pujyashri Shankaracharya Swamigals of Sri Kanchi Kamakoti Peetam. 14) ஸ்ரீ காஞ்சி காமகோடி ஸ்வாமிமலை வேத பாராயணம் ட்ரஸ்ட்: 10-03-2016 ஸ்தாபனம். Vinayakar Chathurthi Uthsava Parayanam : At Thiruvalanchuli Started from this year. Duration : 28-8-2016 Sunday to 06-09-2016 Tuesday. Timing …. : 8:00 a.m. to 10 a.m. and 6:00 p.m. to 8:00 p.m.
Venue …. : Sri SwethaVinayakarKoil, Thiruvalanchuli (near Swamimalai, Tamil Nadu). Rig Veda KramaParayanam …. : 3 vidwangal participated. Rig Veda SamhithaParayanam : 3 vidwangal participated. Veda Vidvangal after 3rd kaala poojai Deeparadhanai . Swamimalai Veda Parayanam was Inaugurated on 13-09-2010 by 6 Veda Vidvangal drawn 2 each from Rig, Krishna Yajur&KouthamaSamaVedam, followed by Parayanam on every Anusham. Thittireeya Upanishad Parayanam is arranged starting from the year Vikruthi on every Aradhanai day of HH Sri MahaPeriava on 01-01-2011. From 24-03-2011 Anusham, the content of the parayanam was enhanced to include the SuklaYajurVedam and the rare JaiminiSakhai of SamaVedam. Thus now 10 Vedic Scholars, 2 each from Rig, Krishna Yajur, SuklaYajur, Kouthama & JaiminiSakhas of SamaVedam participate in the Parayanam. Any Program on Veda Parayanam is deemed to be exhaustive only when all the four Vedas (including AtharvanaVedam are accommodated. However Atharvana Veda Vidvangal have to be drafted from out-stations. So, In our efforts to bring AtharvanaVedam also into the perview of ‘Swamimalai Veda Parayanam’, an annual program was arranged. During 6th to 8th Aug 2011, ending with Anusham on 8th Aug 2011, ATHARVANA VEDA SAMHITHA POORNA PARAYANAM was rendered by 4 South Indian Atharvana Veda Pundits. It is an unique programme in the sense that the 4 Pundits were “Dwi-Vedies” i.e. besides their own Veda Sakhai, have additionally completed Vedaabyasam of AtharvanaSounakaSakhai. Two of these scholars are the ones whom during mid-1960s HH Sri MahaPeriava sponsored to undergo Atharva Veda Paatam for 5 years under an eminent scholar at Gujarat. From the year 2012 onwards, this is conducted for 4 days at a stretch. JaiminiSama Veda Vidwangal are drafted for parayanam from Thohur near Trichy and Athrvana Veda Vidwangal from Chennai, Thirupathy and Bangalore. The scope of the parayanam was extended to SuklaShashtialso fromNandana Year 2012-2013. Now 27/04/2012 onwards, Parayanam is being held on every SuklaShashti also besides Anusham. Their Holiness have further directed that this Parayanam, presently conducted on every Anusham & SuklaShashti be gradually extended to be held “DAILY” (Nithya Parayanam) on all Vedas. Accordingly we were graced to start Rig Veda Nithya Parayanam from 21-09-2012 synchronizing with Anusham & Sukla Shashti. 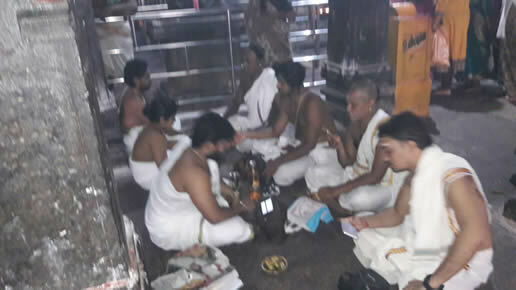 It is customary that the “VyasaPoojai Vasthram” from Sri Kanchi Kamakoti Peetam is offered to Swamimalai Sri Swaminathaswamy every year during ChaathurmasyaVratham. In line with this tradition, as directed by their Holiness, on the concluding day of Atharva Veda Parayanam 8-8-2011 Anusham, Ushath Kala Abhishekam was performed to the Lord; Sri Rudram, PanchaRudram, Sama Veda Rudram, Atharvana Veda Rudram, KumaaraSooktham followed by chamakam, PurushaSooktham&NakshatraSookthametc were all rendered by Veda Parayana Pundits. Sri Swaminathaswami was adorned with the “VyasaPoojaiVastram”. The entire event was an enthralling divine scenario. “KumaaraBhojanam” was arranged as a part of VasthraSamarpanamprogramme. Same evening, AnushaParayanam was performed by 14 Vedic Scholars. 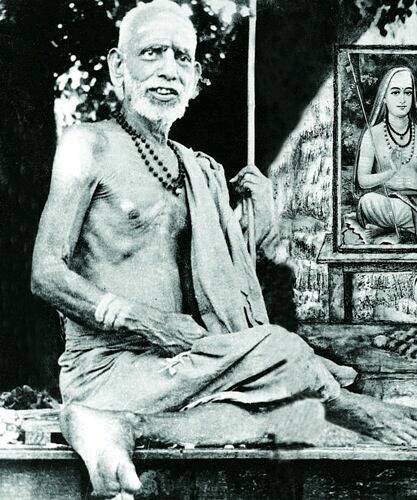 From Vijaya Year (2013-2014) onwards, Rig Veda Sookthangal Parayanam is arranged on every Jayanthi of HH Sri Maha Periava. The first parayanam was performed on 25-05-2013 during 7:30 to 10:30 A.M. on Ganapathy Sooktham, Souram, Purusha Sooktham, Pancha Rudram, Devi Sooktham, Pavamanam, Manyu Sooktham, Go Sooktham, Kumaara Sooktham (rendered in “Thiruchendoor Pattern”), kumaara Upanishad, Veda Manthrangal on Sri Subramanyaswamy etc. For the first 2 years 2011& 2012, Atharvana Veda Poorna Samhithai Parayanam was held once during a year. Their Holiness directed that this will be twice a year from 2013 onwards. The 1st session was during 11th to 14th Sep 2013, and the 2nd session from 5th to 8th Nov 2013 coinciding with Skanda Shashti on 8th Nov 2013. As directed by their Holiness, the scope of Swamimalai Veda Parayanam was extended to every KritthikaiNakshathram on Rig Veda Sookthangal. The first Krithikaiparayanam was held on 28-01-2015 with 6 Brahmacharee Veda Vidwangal. ஸ்ரீ மஹா பெரியவா அவர்களின் பூர்வாஸ்ரம குல தெய்வமான ஸ்வாமிமலை ஸ்ரீ ஸ்வாமிநாதஸ்வாமி கோவில் கும்பாபிஷேகம் சென்ற 9-9-2015அன்று நடைபெற்றது. அவதாரகை நடைபெற்றது. அனைத்து வேத வித்வான்களும், யாகசாலை சிவாசார்யார்களும் கௌரவிக்கப்பட்டார்கள். 24-10-2015அன்று மண்டல அபிஷேகம் நடைபெற்றது. ருக், க்ருஷ்ண யஜுர், சுக்ல யஜுர், கௌதம ஸாமம், ஜைமினி ஸாமம், சௌனக அதர்வணம் ஆகிய 6 சாகைகளில் 25 வேத வித்வான்கள் சதுர்வேத பாராயணம் மிகவும் ச்ரத்தையுடன் மிக உன்னதமாக நடத்திக்கொடுத்தார்கள். அனைத்து வேத வித்வான்களும், கோவில் சிவாசார்யார்களும் கௌரவிக்கப்பட்டார்கள். ஸ்வாமிமலை வேத பாராயாண திட்டத்தின் விரிவாக்கமாக, ஸ்ரீ பால பெரியவா உத்தரவுப்படி, திருவலஞ்சுழி ஸ்ரீ ஸ்வேத விநாயகர் கோவிலில் சென்ற 17-09-2015 விநாயகர் சதுர்த்தி அன்று1-10-2015 முதல் ஒவ்வொரு சங்கட ஹரண சதுர்த்தி அன்றும் மாலை கர்பூர அபிஷேகத்தின்போது ருத்ரம், சமகம் மற்றும் விநாயகர் ஸம்மந்தமான ஸூக்த பாராயணம் .